We are committed to provide you quick delivery, good pricing, superior quality INA SL014914 bearings. 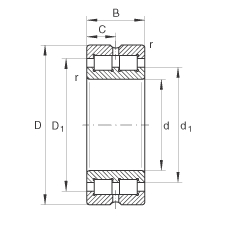 SL01 series full complement Cylindrical roller bearings is kind of no sealed bearing, its outer ring is the whole split kind and the connection lock plate fixed together, thus SL01 series can't bear axial load, so the outer race after subdivision of the outer ring is exactly the same, each with a guard, can make two direction axial positioning. Inner ring with three guard. Outer ring with oil groove and three lubrication hole, this series bearing usually for oil lubrication. 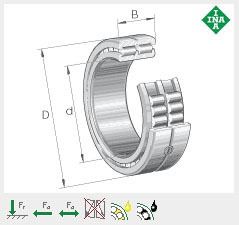 Rolls Bearings Limited could provide you enquiry for INA SL014914 bearigns including availability,pricing, technical parameters.We have strong cooperation with brand bearings suppliers which have Large warehouse, inventory enough, great variety of most bearings. At the same time,Rolls Bearing Limited are commited to offer you the fastest, most reliable quality and the most reasonable price for INA SL014914 bearings.In this way,we can help our customers achive your requirement of brand bearings.Regarding the price cheking.stock availability and product data sheet,please call or email us freely.